One of my projects this year is to prepare and deploy a lab set of iPod touch devices for use at our Middle School and High School. Many of our teachers use video and audio recording as a way to assess student learning. Using the iPod would allow students to record, edit, and send products to the teacher without having to worry about getting to a computer lab or cart. As I go through the process of preparing the labs for deployment, I plan on sharing the progress on this project here. Our district is currently investigating the concept of Bring Your Own Device for students in our schools. If it would pass, we have a good number of students who have iPod touch and iPhone devices that they bring with them to school. Students keep these devices in their pocket, until they can use them before and after school. The iPod touch sign out lab would be a way to supplement a classroom so that all students have access to a device during a class activity, instead of having to be paired up with someone else who owns a device. What will these devices be used for ? We have had more and more teachers using technology for students to create book trailers on Animoto, audio recordings with Audacity, and videos with Flip cameras and MovieMaker. One of the drawbacks has been the availability of resources, mainly in computer labs and/or netbook carts. The other obstacle at times is setting up microphones to properly record audio, depending on the type or vintage of machine being used. When audio is being recorded, it is impossible to have students spread out in a computer lab to try and cut down on the background noise being recorded. 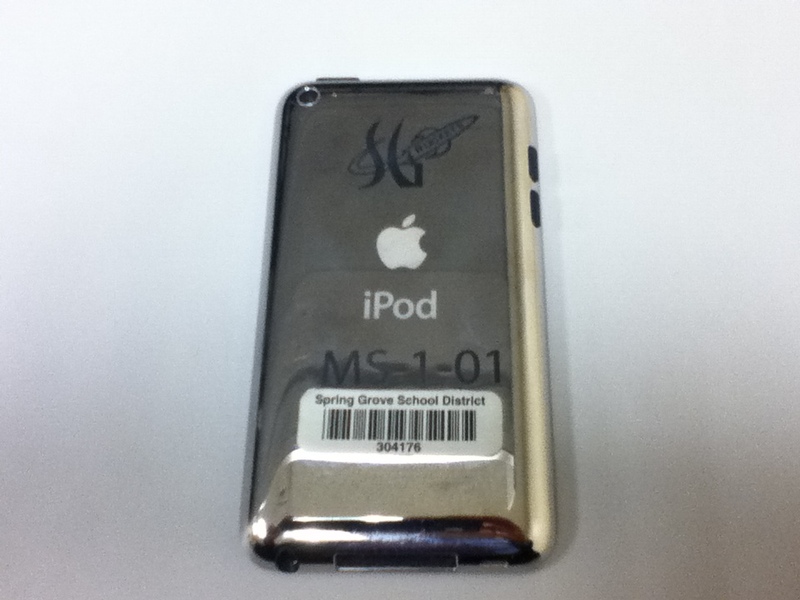 By using the iPod touch, we will be able to use the built in camera and microphone to gather images, audio, and video. The portable nature of these devices will not only allow us to use them in various locations easily, but will also enable the teacher to use them quickly as a part of the lesson, without the hassle and disruption of moving to the lab. Students will also be able to edit their recordings on the iPod itself, which will cut down on the amount of time required for smaller activities and assessments. The majority of apps will be for product creation. Drill and practice content apps will be limited, and will not be the primary use of these devices. I will discuss the apps installed on the devices in more detail with my next post. How will they be deployed ? This will allow greater flexibility in distributing the iPods. For example, if a teacher wants each student to record an audio response to a question, then both cases will be used to provide a set of 30 iPods. If a teacher wants to do a video project, chances are that the students will be working in pairs, so that 15 iPods would suffice, allowing the other set of 15 to be available in other classrooms. 1. Email – each Ipod has been configured with a Google Apps email account. This email is identified as the iPod itself, which are all numbered. Many apps, including Voice Memo, Splice and Animoto, have a share by email feature . 2. Dropbox – each iPod has the DropBox app installed on it. 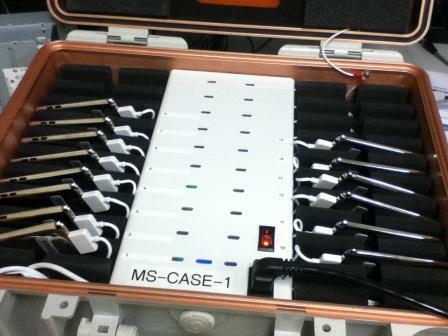 All of the iPods in one case (set of 15) are set to the same DropBox account. Teachers will be provided the username and password to each account to download student projects to their computer. 3. Drag and Drop from Media folder – connecting the iPod with the USB and treating it as a thumb drive. This will be the option for grabbing video projects that are too large to email or upload to DropBox. Using these methods as opposed to syncing will also allow students who use their own devices to submit work to the teacher. In my next post, I’ll go over some more detail on the preparation of the devices, including device settings, syncing, and apps that are installed on each iPod. Instructional Technology Specialist for a school district in York County, PA. Former science teacher. Looking to help teachers use technology naturally with their teaching instead of trying to "add it in" . This entry was posted in Handheld Devices, iPod and tagged ipod touch, teachers using technology. Bookmark the permalink. 1. What if a project is unfinished? Since they are shared devices, couldn’t another student tamper with a file that isn’t there’s? 2. How does the Google Apps email work with different users? Don’t you have to load a personal account to each device? Or do students log in with each use? What if they forget to log out? Just curious. Please respond when you can. In response to your first question, yes, a student could tamper with another student’s file. However, each time the lab is used, the students would use their assigned iPod number. If there would be an incident of a student’s file being deleted, there would be a record of who had been using each device. This should help deter students from tampering. I had a similar situation in the past when I had a class cart of Macbooks in my science classroom. Our school was unable to connect the laptops to our Novell network, so students were not able to log in. All of their files were saved directly onto the hard drive. Fortunately, in the 2 years I worked with the cart, I had no incidents of students tampering with other files. This will be something to keep an eye on as we deploy the labs later this month. In reply to your second question, our district has Google Apps for Education. I created an email address for each iPod, matching the number identity of the iPod. For instance, iPod HS 1-01 was given the email address hs1_1@springgrove.org . The email password is entered into the settings, so the students do not have to enter it in. The only part the students will have to do is include their name in the subject of the email and enter in the teacher email address to send to. Using the Google Apps control panel for our district, these email accounts will be limited to only sending email to our own domain, so that students can only email our teachers with the iPods. Thanks for the response- helpful for my pondering. John, it appears that you are off to a good start and I applaud your efforts. I am anxious to follow your progress and learn of the results of this initiative as well as the students’ and teachers’ reactions. You obviously have thought this through and have a firm grasp on the apps that will be used to meet the learning objectives.